The nation’s bicentennial year of 1976 was a watershed for westerns. 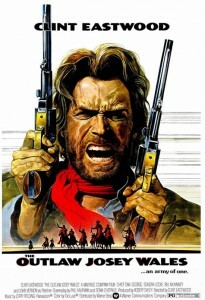 The early 1970s had seen a number of westerns, many of them “revisionist” or strongly influenced by spaghetti westerns. 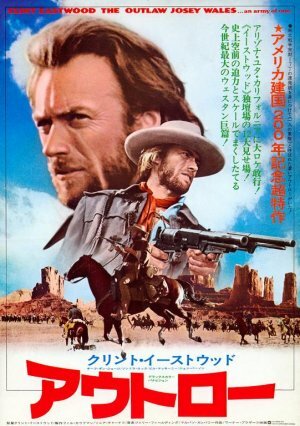 The summer of 1976 saw the release of two excellent traditional westerns: The Shootist and The Outlaw Josey Wales. And then the genre fell completely out of fashion and largely disappeared. The Shootist marked the end of the cinematic career of John Wayne, and it is tempting to see that as the end of westerns generally. 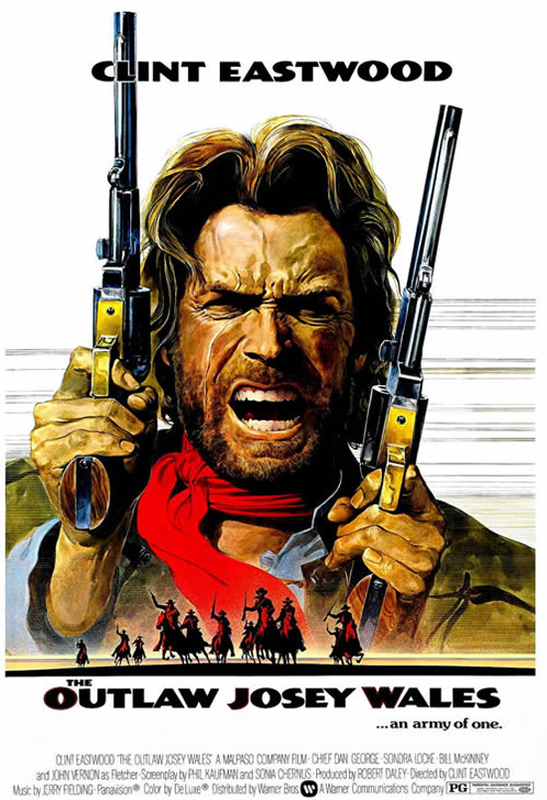 But The Outlaw Josey Wales in the same year was an early directorial effort of Clint Eastwood, who would become one of the great western directors as well as continuing to reinforce his status as a great western star. And Bill McKinney managed to be in both The Shootist and Wales as a villain, a remarkable accomplishment. Wales (played by Eastwood) is a Missouri farmer at the start of the movie. His family is killed, and he is left for dead, by Union-sympathizing Kansas Redlegs led by McKinney’s character. Wales joins southern border guerrillas under Bloody Bill Anderson and rides with them through the Civil War. In the fighting, Wales has honed his skills as a warrior, particularly as a “pistolero.” All this is set up economically at the start of the movie. 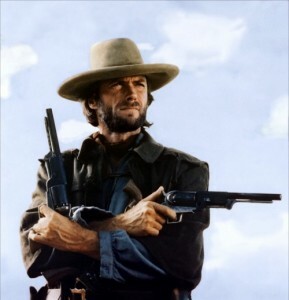 The quintessential Josey Wales shot. Wales demonstrates his ability to sneak up on an Injun (Chief Dan George). There are nice casting touches throughout the movie. John Vernon is good as the conflicted traitor/hunter Fletcher. Bill McKinney is relentless and despicable as the leader of the Redlegs. Sam Bottoms gives what may be the best performance ever by any of the Bottoms brothers, playing a dying young Confederate from Alabama in the early part of the movie. 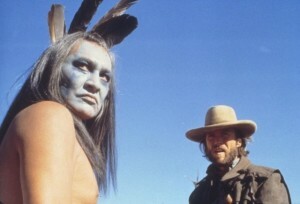 Will Sampson has an appropriate gravitas as Ten Bears, the Comanche chief. John Russell briefly appears at the start as Bloody Bill Anderson, and Richard Farnsworth is one of the Comancheros. The denizens of Santo Rio make a nice ensemble, including longtime western character actor Royal Dano. The weak point in the cast is Sondra Locke as Wales’ romantic interest, but she was Eastwood’s girlfriend at the time. And she doesn’t get in the way that much. The Outlaw Josey Wales has a nice look to it. It’s not as glossy as some westerns, but the interior lighting seems more authentic, and the backwoods characters dirtier than in more Hollywood-ized period westerns. Wales carries multiple pistols (Walker Colts, which were substantial), two prominently at his waist (not tied down on his legs). He can also use a rifle to good effect, as he does to give the Redlegs a “Missouri boat ride.” The movie was filmed on the Feather River in northern California and in southern Utah, and uses its settings well. Wales (Clint Eastwood) negotiates with Comanche chief Ten Bears (Will Sampson). There’s a fair amount of violence in this one, and Wales displays one of the very best cinematic versions of the famous “border shift,” in which the gunfighter reverses the positions of his guns to put them in firing positions. In addition to sporadic violence throughout the movie, rather a lot of Locke gets flashed when she is attacked by the loathsome Comancheros. Eastwood would yet make more westerns, but only a couple more. They’re good, though: Pale Rider and Unforgiven, also on this list of great westerns. Josey Wales doesn’t have the pure nasty punch that the later Unforgiven does, but it has much more re-watchability. The underlying novel, Gone to Texas by Forrest Carter, is decent, too. This entry was posted in 55 Greatest Westerns and tagged Chief Dan George, Civil War, Civl War Aftermath, Clint Eastwood, Native Americans (Indians) on August 21, 2013 by Nicholas Chennault. I like this one a lot more than Unforgiven, particularly because it’s got so many quotable lines, such as Wales’ “you gotta get mean” pep talk to the Jayhawk family when preparing to defend their house from an assault. And Chief Dan George’s delivery of the “endeavor to persevere” story. I also liked the song “Rose of Alabama,” although I can’t find it anywhere else and I don’t even know if it’s a real song. “Rose of Alabama” is definitely a real song of Civil War vintage. It’s one of the touches (like Wales’s Walker colts, for example) that help provide a feeling of authenticity. And you’re right about this having a lot of memorable lines. 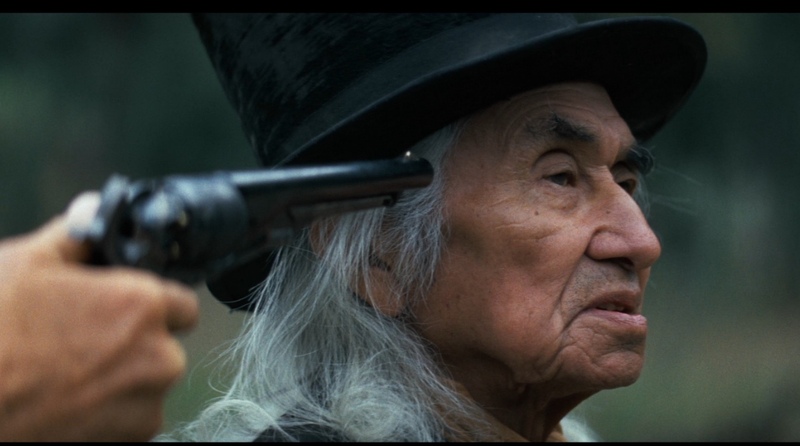 On the web you can find pictures of Chief Dan George as Lone Watie, with the legend “Endeavor to Persevere” emblazoned on them. And now you can get your own Josey Wales jacket and hat if you want. I hadn’t searched for it in a few years and now it’s easy to find (there’s a small Quicktime playable version on this page. Jake and I watched this a handful of times back when we were dating and first married. I liked it and it is watchable, although I could never put my finger on exactly why. Thanks for providing some insight into its merits. p.s. this movie should come with a warning that “Rose of Alabama” can get stuck in your head for weeks afterward!